There are lots of bike stands out there to choose from… some are cheap, some are built into car racks like the Küat NV 2.0 and some are even powered with electricity! 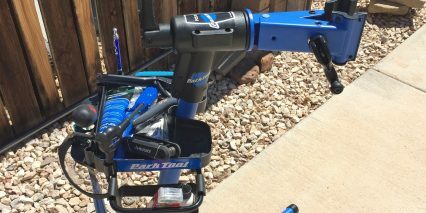 I chose the PCS-10 from Park Tool because I liked the way it looked, have seen other stands and tools from the same brand in lots of bike shops that I trust and appreciated the lifetime warranty. I didn’t just buy a stand, I got some other accessories to go along with it and it made me feel good to match the blue colors and feel like the parts would work together properly. Interoperability is actually a leading reason I spent the extra $50 for the PCS-10 verses the PCS-9. 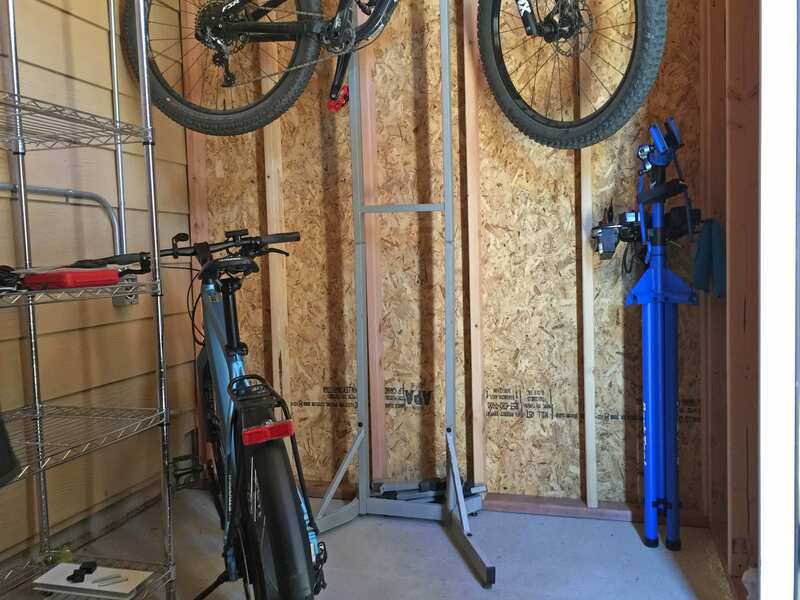 Both racks fold, both can handle 80 lbs of weight (which was important since I work on heavier electric bikes) and both have a decent clamp system. I knew I wanted to add the work tray adapter to help organize parts and tools and this requires mounting holes that only the higher level offerings have. 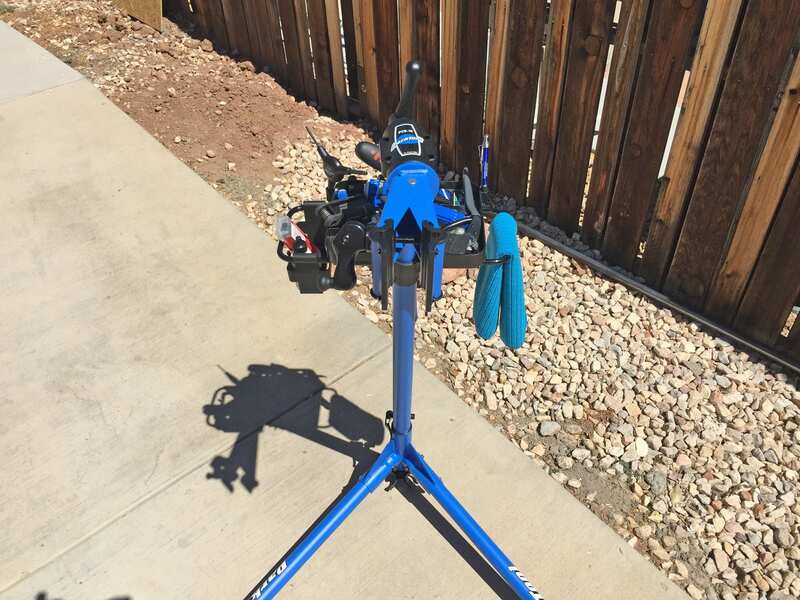 I thought about going for their premium portable bike stand, the PSR-25 which offers 100 lbs of weight capacity and is listed as being lighter weight but it just didn’t seem worth it… and I liked the blue color vs. black. To my delight, upon receiving the mid-level PCS-10 I weighed it at 16.5 lbs vs. the 25 lbs listed on their official website. That’s a big win because I do fold and carry it along in my car occasionally and lean it in the corner of my shed. 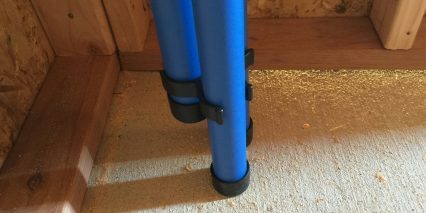 With the legs folded in and the cuff slid all the way up you’re looking at just 41″ of length and the support arm at the top (which holds the clamp jaw) can be removed quickly and easily. I love how solid and smooth this thing operates. 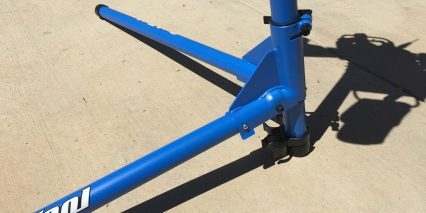 You can spin the support arm all the way around (allowing you to flip bikes upside down when they are clamped in) and the clamp itself has soft rubber jaw covers that are replaceable for under $15. 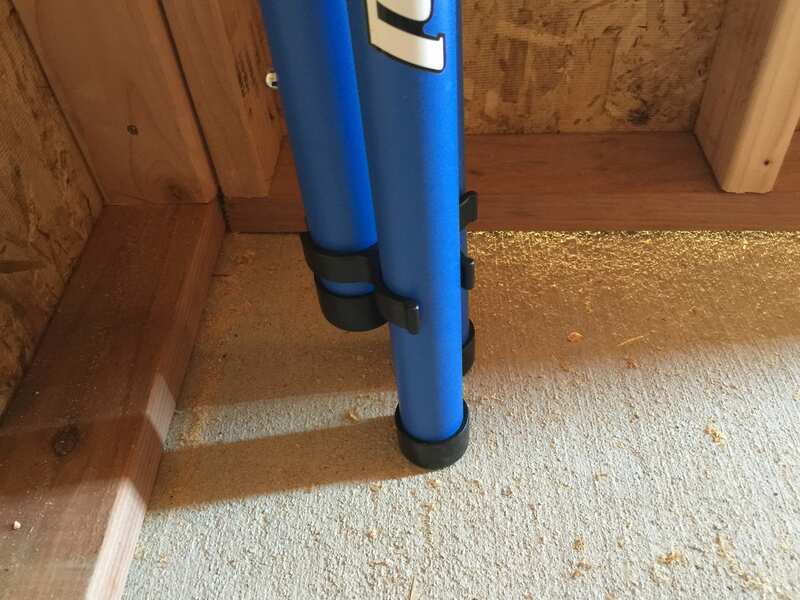 None of my bikes have been marred so far and I have been able to work with tapered seat posts (dropper posts) without having a perfectly smooth flat surface. 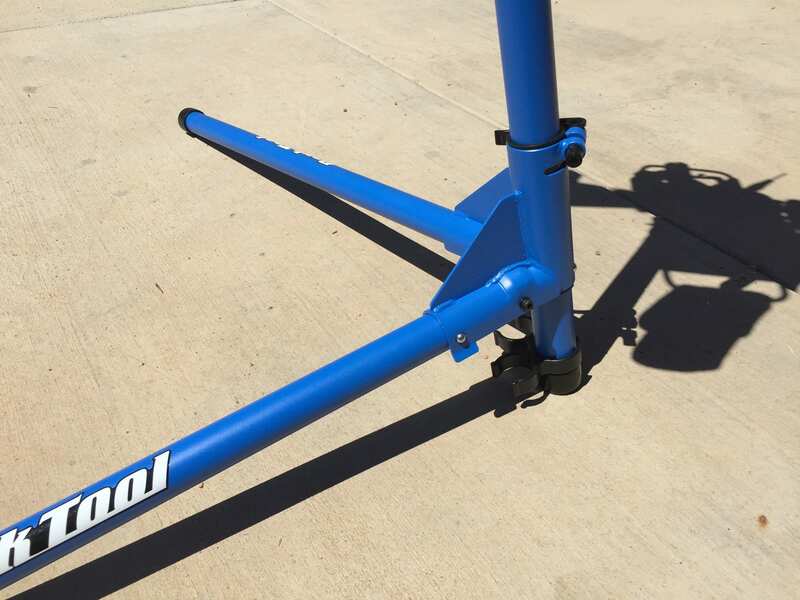 The jaw is ~3″ deep and can accommodate aero posts (that are more oval in shape) as well as curved sections of frame. 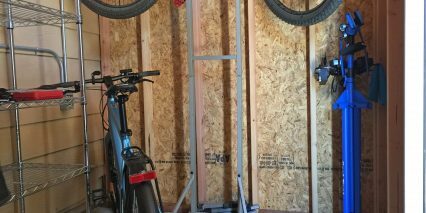 This means you can use the stand for more than just standard bicycles… consider ebikes, step-thru electric bikes, recumbent bikes and possibly even trikes! 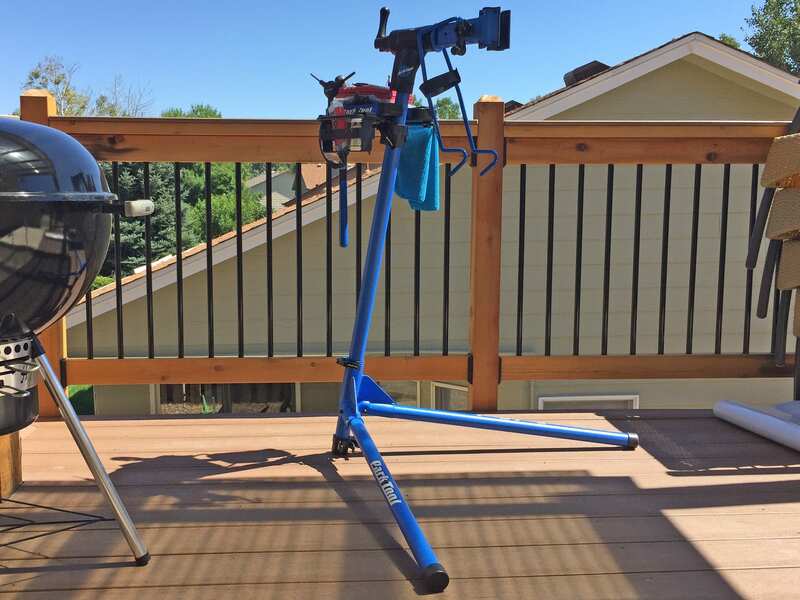 The stand is solid and easy to operate even if you’ve only got one free hand. 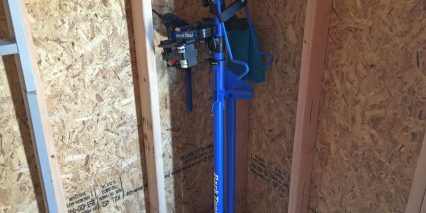 I found the crank levers to be easy to grab and turn quickly… and with the main clamp you can set it for the correct width and then hinge it shut. There’s a neat cam system that lets you go from open to close in one motion, saving time and preserving your set width. 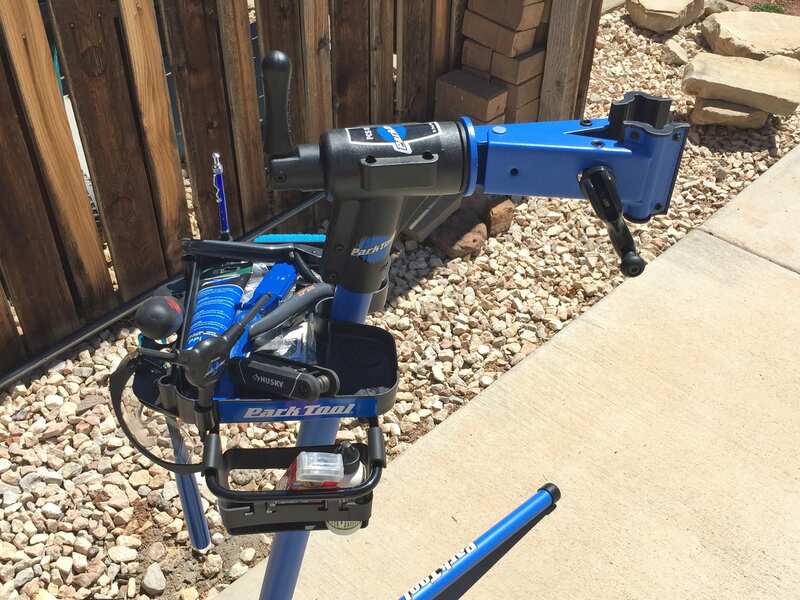 Using this stand has been fun but in total, I paid over $300 including the Park Tool accessories to go with it. For me it was worth it because I do lots of bike assembly and maintenance but consider using a mobile bike repair service like VeloFix or just going to your local shop vs. buying all of these tools yourself. 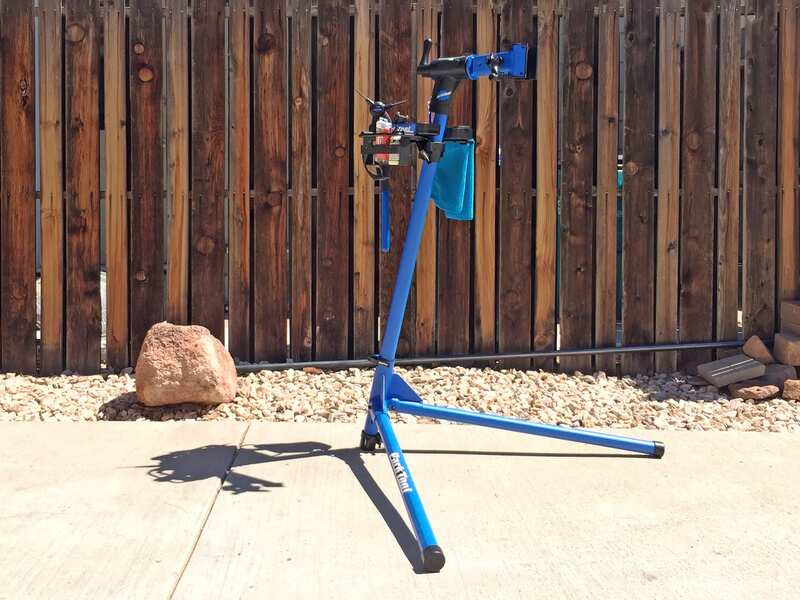 It only costs ~$150 to have a bike assembled and tune ups are ~$70 so you’d be assembled and tuned twice for what I paid just to get started then do the work myself! Looking back, I would still choose this exact same stand… It should last well and I love how compact it gets. 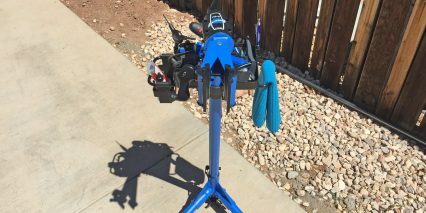 Some of the other accessories I bough along with it to match were the front wheel straightener HBH-2 Handle Bar Holder, the PW-3 Pedal Wrench (which fits 15 mm and 9/16″), the TL-6.2 Steel core tire lever set (which I really like), a 4 oz tube of PPL-1 Polylube 1000 Grease and their iconic AWS-8 balldriver hex wrench y-design set (has 4 mm, 5 mm and 6 mm heads). Each of the tools has done its job and the tray has worked okay… though I wish it had larger holes to put scissors and thicker drivers and I also wish that the side basket portion wasn’t so open because tools can fall through the sides there. The most surprising thing about this accessory has been how solid, smooth and easy to use it has been. 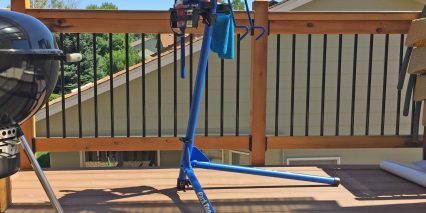 The biggest surprises have been around how to fold it completely down, which way to mount the accessory basket and also how easy it is to sort of bump the basket sideways if you don’t tighten the height tube down. My tools are now overflowing in the basket and occasionally it gets pushed side to side. 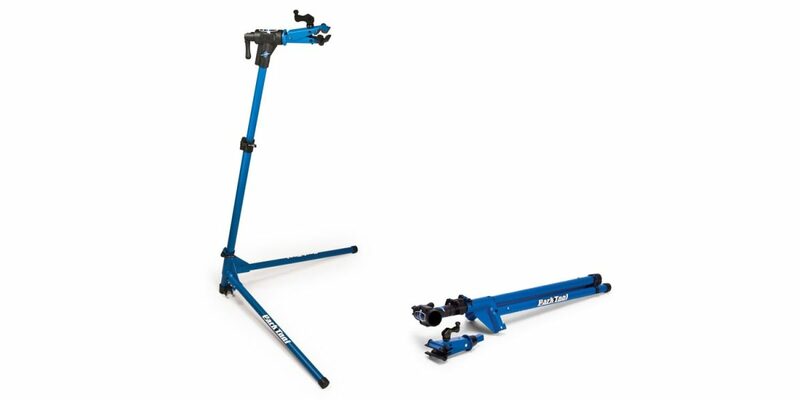 Part of me longs for the true heavy duty shop stand but I wouldn’t want to spend much more than I already have for tools. I feel like these will last and if I move or need to help a friend they are easy enough to toss in the car. It’s also comforting to think that any future accessories from Park Tool will also work here, I’ve been considering the paper towel rod adapter. I have this same stand and a matching box full of Park tools. They are the bomb. I agree with your comments, both pros and cons. Overall, this is a great tool and glad I bought it! 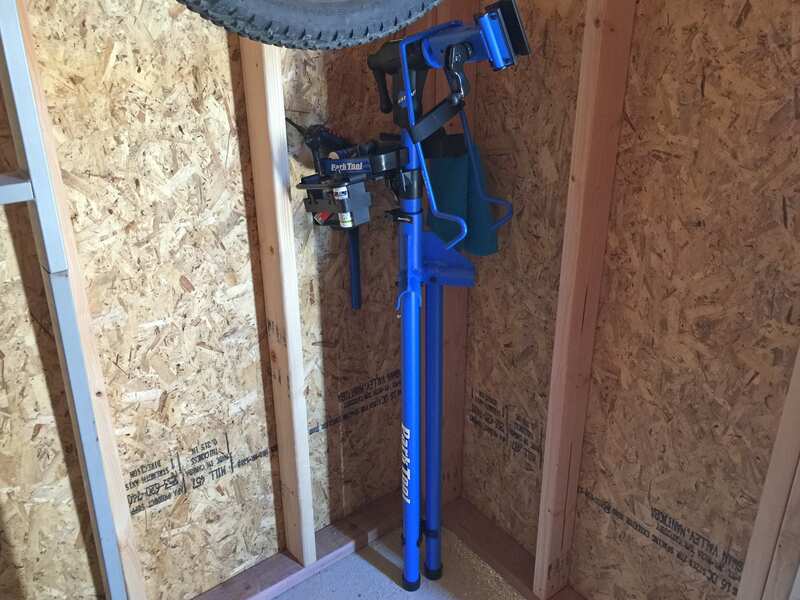 Yes, I’ve used the Park stand for my FLX trail and the other half dozen bikes in the shed. 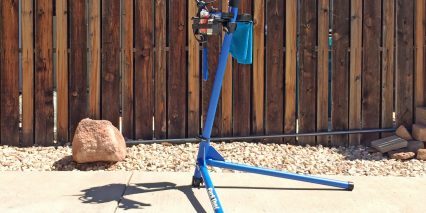 It has no trouble handing my 55 pound FLX or anything else.